Posted on July 31, 2013 by Ching under Travel, Zumba. Getting ready for the Zumba convention in Orlando in a couple of weeks. Yup. 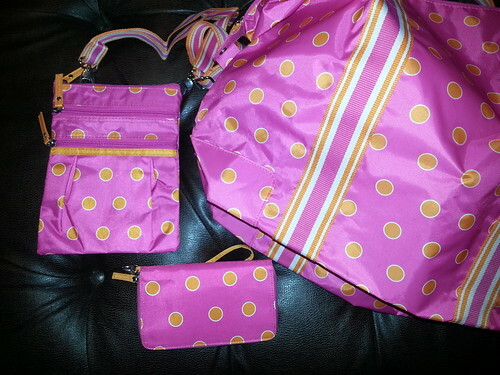 My wallet, purse, and duffel are all matchy matchy. Sue me. I got the bags from All For Color back in winter when I registered for the convention. I figured I needed some colorful bags for such a colorful event. They have some other pieces, but I decided not to get too carried away. LOL. I had to order a costume for the ZIN soiree at the last minute because they didn’t announce the theme until last week. The ZIN soiree theme this year is a ZIN Summer Night’s Dream. It’s supposed to be “an ethereal dreamscape of fantasy and bliss buzzing with colorful creatures, pulsating music, flashing lights and more” — sounds like it’s going to be super fun. I can’t wait to see what mythical beings turn up! Posted on July 28, 2013 by Ching under Toys. Dad made this really cool airboat, played with it a few times, and then decided to give it to Brian. Jackpot! He actually used a gift certificate to his favorite hobby store that we had given him for his birthday earlier this year. Naturally, lightbulbs came on. From now on, we’re just getting dad hobby gift certificates for all of the holidays (Father’s Day, Christmas, birthdays, etc.) and then hint at what we would like for him to make. Hopefully, he will end up giving it to us when he tires of it. Just like this one. LOL. Here are a couple of videos of Brian playing with the RC airboat. P.S. If the videos don’t show up, it’s probably because of my privacy settings. Posted on July 27, 2013 by Ching under Food and Drink. 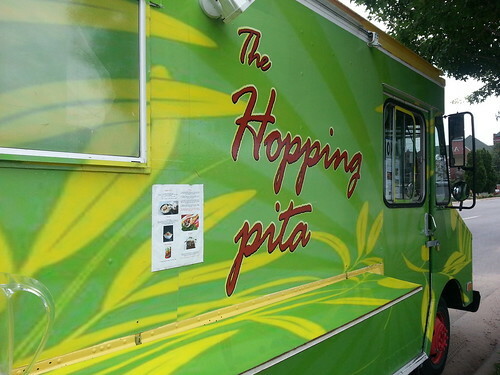 Brian and I finally got to try the Hopping Pita, it’s one of the newest food trucks in town. 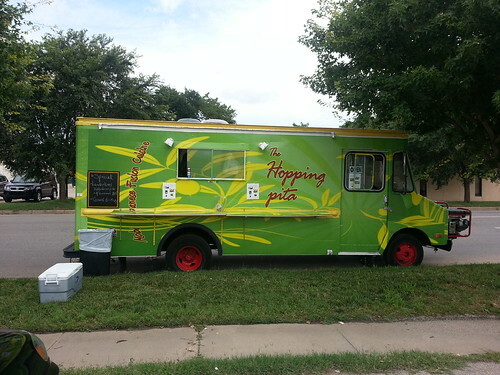 This one serves Lebanese fusion cuisine, or so the side of the truck says. 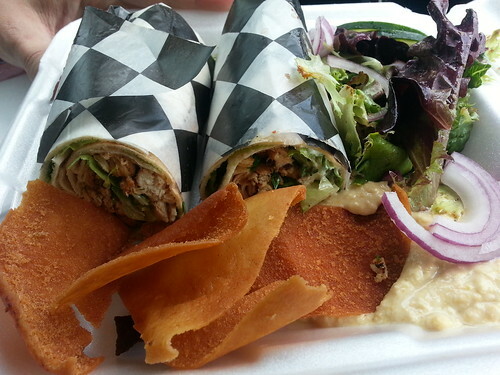 Brian had the chicken shawarma, which was pretty good but not quite as good as Bella Luna. I did appreciate the side of salad and hummus and crunchy pita chips that comes with each order. Both the salad and the hummus were very good; although I must agree with my friend Andrea — they really don’t give you enough chips. I decided to be different and ordered the lamb and beef special. It was good but, in hindsight, I think I should have stuck with the chicken. LOL. Posted on July 27, 2013 by Ching under Games. I’m thinking we are going to lay off the Cards Against Humanity nights for a while because every single time we’ve had it there’s been some kind of disaster. The first time we had it, Brian repainted the tango bathroom with his vomit. The second time we had it, Hideki got Andrea on her injured leg. The most recent time we had it, Brian spilled Apothic Red all over the cards. So yeah. 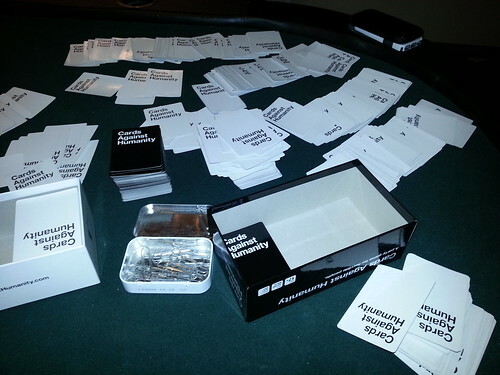 No matter how much fun it is, probably no Cards Against Humanity for a while. Posted on July 24, 2013 by Ching under Food and Drink. 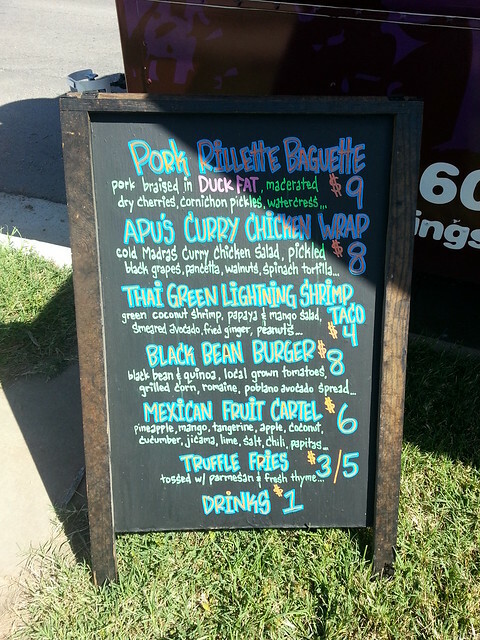 We got to try the Flying Stove’s new menu last week. It was delicious! 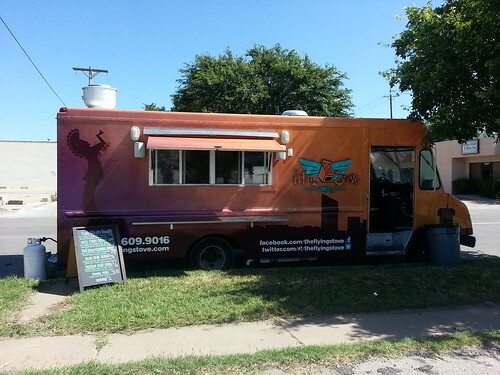 It wasn’t on the diet, but you just can’t pass up Flying Stove when it’s parked down the street from your work. LOL. 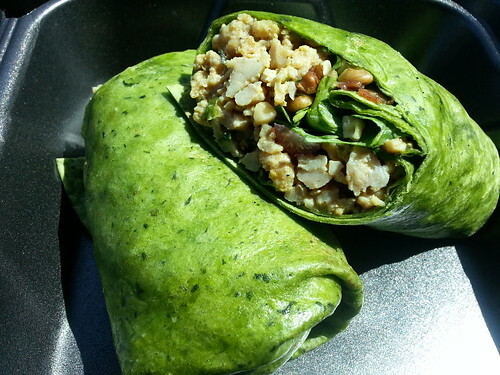 This is Apu’s curry chicken wrap. 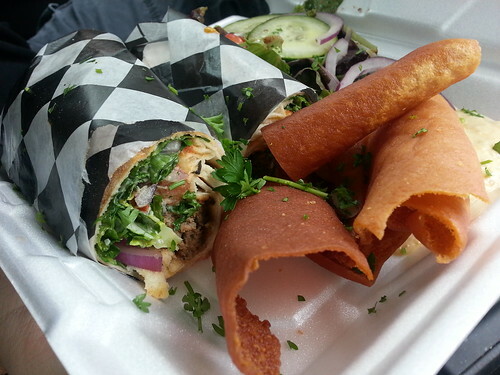 It’s not like the curry chicken wraps that I’m used to… Delicious, but I prefer the curry chicken wrap they serve at MIF Deli. 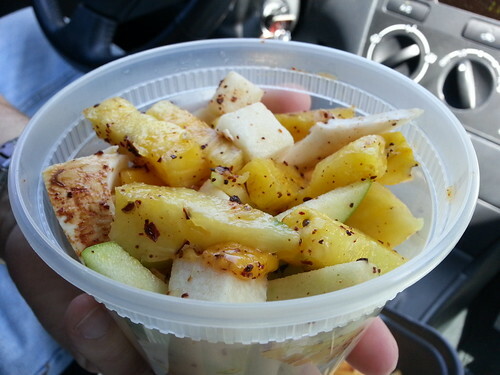 This is the Mexican fruit cartel. Different, but good. It had a spicy kick to it. 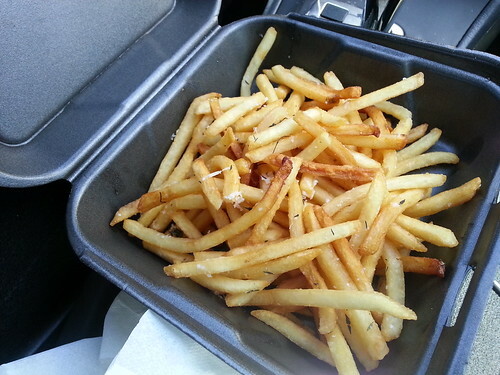 Of course, you can’t eat Flying Stove and not get truffle fries. It’s their signature side. I wish I could eat anything and not get fat. Ugh. Why, oh why, did I ever have to be cursed with such slow metabolism? Blech.